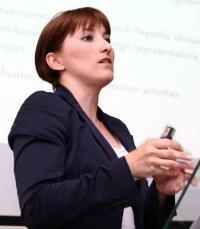 Jana has extensive experience at the senior strategic level in government and industry. She has served as advisor to several ministers and holds advisory positions reporting to owners and CEOs of Czech companies. From 2007 – 2010 she worked as advisor to the Deputy Minister of the Ministry of Industry and Trade and was a Supervisory Board member of both the Czech Export Bank and the Export Guarantee & Insurance Corporation. She worked to ensure funding, promotion and due diligence on large scale international projects that involved the export of Czech products and services abroad. As trends, laws and governments change, Jana was also responsible for the planning and strategy of keeping Czech exporting laws and regulations current and relevant. Additionally, in her capacity as Advisor to the Deputy Minister, Jana and the export promotion department proposed and implemented most of the Czech financial crisis solution and management documents. While working for the Ministry of Foreign Affairs, Jana also authored the first plan for the strategic promotion of the Czech Republic abroad from 2003-06. In 2007 Jana was made Director of Export Promotion for the Ministry of Industry & Trade. In this role she was responsible for the strategy of promotion of Czech trade and exhibitions internationally, including implementation of the branding strategy of the Czech Republic, managing development aid of the Czech Republic in the field of industry and trade, and the management of economic diplomacy; i.e. filling economic councillor posts at Czech embassies around the world. Jana holds MA in Philosophy from the Palacký University, Olomouc.